Breast cancer patients and survivors need no longer worry about eating moderate amounts of soy foods, finds a new review of the research published today on the website of the American Institute for Cancer Research (AICR). The latest update of the online tool AICR's Foods That Fight Cancer™ answers one of the most frequently asked questions relating to how diet may affect breast cancer risk. "Determining whether it is safe for breast cancer survivors to eat soy has been one of the big research questions under study and now we know it is safe - the evidence is so consistent," said AICR Nutrition Advisor Karen Collins, MS, RD, CDN, an expert on diet and cancer prevention who worked with AICR to examine the research and develop the materials. For all cancers, human studies show soy foods do not increase risk and in some cases may even lower it, the review finds. Published online, AICR's Foods that Fight Cancer™: Soy summarizes both current and emerging evidence on soy and cancer risk. The web-based tool highlights AICR/WCRF's reports along with the ongoing laboratory, observational and clinical studies. 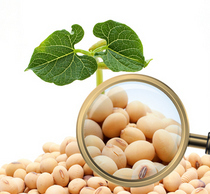 The resource was reviewed by a review committee of leading soy-cancer experts. Previous concerns with soy and increased breast cancer risk stem from soy foods' isoflavones, a group of compounds that in some ways mimic the action of estrogen. High blood levels of estrogen link to increased breast cancer risk. These fears were enforced by rodent studies that suggested the isoflavones’ genistein and daidzein led to breast cancer cell growth. Scientists now know that rodents and most other laboratory animals metabolize soy isoflavones differently than humans, says Mark Messina, PhD, MS, an adjunct associate professor at Loma Linda University and the Executive Director of the Soy Nutrition Institute. And soy consumption does not lead to increased estrogen levels in humans. Six recent human studies and one meta-analysis of these studies found that consuming moderate amounts of soy foods does not increase a breast cancer survivor's risk of recurrence or death. “Human data trumps animal data,” said Messina. The human evidence, clinical and epidemiologic, overwhelmingly shows isoflavone exposure is not harmful for and may even benefit breast cancer patients. A moderate amount of soy is one to two standard servings daily of whole soy foods, such as tofu, soy milk and edamame. Some preliminary human studies suggest that soy foods may be most protective among breast cancer survivors who are taking tamoxifen, but this research is ongoing. For breast cancer risk among cancer-free women, studies on soy consumption either show no link or a slightly protective link to breast cancer. Some research suggests that protective effects may primarily come from consuming soy during childhood and adolescence. AICR estimates that 38 percent of US breast cancer cases every year - approximately 86,000 cases – could be prevented if women were to maintain a healthy weight, be physically active, drink less alcohol and breastfeed their children. To reduce risk of recurrence and secondary cancers, survivors are encouraged to follow these same recommendations. "The evidence is not quite there to start saying soy reduces the risk of cancer," says Collins. "But for breast cancer survivors who want to eat less meat, get protein and enjoy a more plant-based diet, soy is a healthy food and everyone – including breast cancer survivors – can feel comfortable eating it."